 As is usual for a Disney-Ghibli collaboration, the English dub track is remarkably good, and features effective voice acting from actors like Christian Bale, Lauren Bacall and Billy Crystal. Also, the screenplay is a bit more explanatory and fleshed out than the Japanese subtitles, making a viewing of the English dub exceptionally worthwhile. The Skinny: The latest from Hayao Miyazaki and Studio Ghibli is a predictably enchanting affair, though compared to Miyazaki's other works, it's a bit slight and underdeveloped. However, when compared to most crap currently getting a theatrical release, Howl's Moving Castle is infinitely superior, and should definitely be seen. Hayao Miyazaki adds to his peerless filmography with the rich and moving fantasy Howl's Moving Castle. Based on a novel by British author Diana Wynne Jones, the film takes place in a fictional pseudo-European world where magic exists. Sophie (voiced by Chieko Baisho) is a stubborn, but unconfident young woman who's resigned to running the family business, a hat shop left to her by her father. She also grouses about how she's not beautiful, and seems uninterested in changing her life. Enter Howl (voiced by *gasp* Takuya Kimura of SMAP), a rogue wizard who accidentally drags Sophie into his world. After a chance meeting with Howl, Sophie is immediately smitten, but she incurs the wrath of the Witch of the Waste, a notorious sorceress who's after Howl's heart. Thanks to a curse from the Witch, Sophie is transformed into a 90 year-old woman, and is soon on her own, trekking into the mountainous region known as the Wastes in order to find a cure. 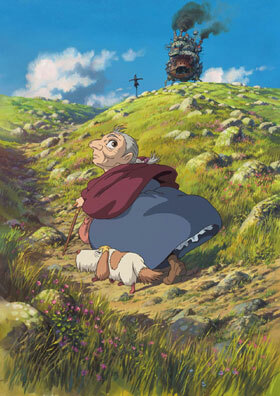 She ends up finding Howl's moving castle, a magically-mobile home powered by a kept fire demon named Calcifer. Immediately, Sophie ingratiates herself into the lives of Calcifer, Howl's young apprentice Markl, and finally Howl himself. She becomes the castle's self-appointed cleaning woman, and slowly comes to learn about Howl, his conflict with the Witch of the Waste, and his rift with the King's sorceress Suliman. Sophie also comes to learn about herself, and through her care of the castle and its inhabitants, begins to free herself of her self-imposed limits, and perhaps even her curse. But will her newfound strength be enough to save Howl? For an animated film, Howl's Moving Castle is immediately impressive. The world Miyazaki creates is rich and detailed, and is perfectly complemented by the score from usual Miyazaki composer Joe Hisaishi. The animation is detailed and expressive, and full of the clever little touches and nuances that Miyazaki and Studio Ghibli are known for. Sophie starts as an unconfident character, but through her journey grows into a typical headstrong Ghibli heroine. The supporting characters are endearingly portrayed, from the irreverent fire demon Calcifer, to the mute scarecrow Turnip-Head, to even the corpulent Witch of the Waste. As usual, Miyazaki invites the viewer into his world on his terms, never pausing to really explain anything. That's fine, though; Miyazaki ultimately reveals enough about his characters and situations to get them to matter to the audience. Still, Howl's Moving Castle feels less successful than Miyazaki's previous works, namely Princess Mononoke and Spirited Away, two films that can easily be called masterpieces of the art form. Like those two films, there are no real bad guys in Howl's Moving Castle; instead, the characters face larger concepts like war, politics, the destruction of nature, and an individual's personal growth. Miyazaki's characters are alternately greedy, selfish, noble, and heroic, and their actions define them more than any narrative explanations ever could. But Miyazaki doesn't entirely succeed at integrating his characters into the film's larger conflicts. There's a war going on in the film, and Howl is decidedly against it, but his decisions and deeds seem remote from the film's main drama, and subsequently removed from the audience too. Howl is also underdeveloped; he's certainly a charismatic figure, and his vanity and self-abandon ultimately prove compelling. But when the most important drama occurs he's usually somewhere else.